Hours for the festival are 9 a.m. to 5 p.m. each day, rain or shine. Daily general admission tickets will be on sale at the gate. General admission for adults is $8.00 per day. Charge cards and debit cards not accepted for admission. Children 12 and under are admitted free of charge. There’s no additional charge for entertainment. The festival has acres of free parking. Bus tours are welcome and group rates are available. No pets or alcoholic beverages are permitted on festival grounds. No smoking permitted inside the woods. Keep in mind the graveled pathways are great in case of rain, but pushing a stroller may be difficult. The festival location is 44337 County Line Road (just off Rt. 7) Columbiana, Ohio 44408, one mile north of the intersection of State Route 14. The location is only minutes from the Ohio Turnpike and the Pennsylvania state line. For more information, contact Old-Fashioned Christmas in the Woods, Inc. at 433 State Avenue, Beaver, Pa. 15009, 724-774-6341. E-mail address: christmas@mcgaffic.com. ATMs are located outside the woods at the EMS building near Gate B and at the Information Booth inside the woods. EMS is located at the corner of the woods near Gate B. In case of emergency, each ticket booth or security staff can assist in radioing EMS team. Available at three locations: inside the woods near Gate A and outside the woods at Gates B & C.
The Information Booth is located inside the woods along the fence between Gates B & C.
For your convenience, a baby changing station is located at the Port-A-John area inside the woods near Gate A. 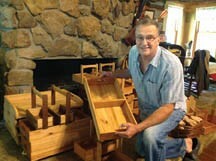 One of the many artisans demonstrating a craft and selling wares during Old-Fashioned Christmas in the Woods is Larry Kraus of Kraus Kreations in Beaver County, Pa.
Get the background scoop on these talented individuals.